Based on true story of civil rights hero Gordon Hirabayashi. PASADENA — The Pasadena Playhouse will present “Hold These Truths” from May 30 to June 23 as part of the theater’s 2016-2017 season. Written by Jeanne Sakata (also an actress with extensive stage and screen credits), directed by Jessica Kubzansky (The Pasadena Playhouse’s “Pygmalion” and co-artistic director of Boston Court), and starring Ryun Yu (Geffen Playhouse’s “Take Me Out”), “Hold These Truths” is a shockingly relevant cautionary tale of the injustices perpetrated when nationalism, fear and hysteria collide. As the play centers on issues of democracy, constitutional laws, and what it means to be an American, The Pasadena Playhouse will present post-show engagement activities in order to help facilitate conversation around these timely topics. The free post-show events are in cooperation with community organizations throughout Los Angeles. This season also included “The Originalist” by John Strand, which ran from April 11 to May 7. It told the story about a liberal law student’s nerve-wracking clerkship with U.S. Supreme Court Justice Antonin Scalia. “As the State Theater of California, it is our mission to bring people together to facilitate open dialogue regardless of political affiliation and belief,” said Producing Artistic Director Danny Feldman. “It is through art that we can engage in healthy discourse with our neighbors, friends and community. We are thrilled not only to be producing these wildly entertaining and powerful plays, but also to be able to partner with organizations throughout our community to continue the dialogue after every performance of both plays. Seventy-five years ago, Executive Order 9066 called for American citizens to be ripped from their homes and forced into concentration camps, detained solely based on their heritage and ancestry. Amid the chaos, one young student stands up for what he passionately believes is right in the face of a country deeply divided between national security and freedom for all. 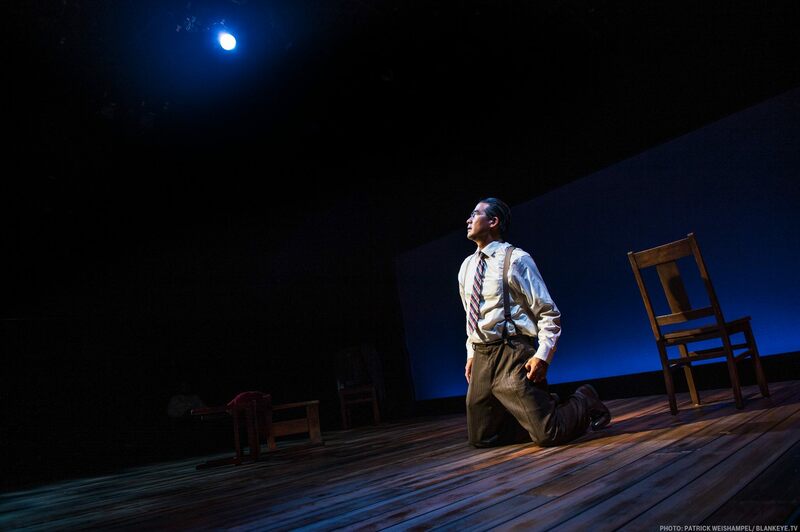 “Hold These Truths” is based on a true story that follows the life of civil rights hero Gordon Hirabayashi (1918-2012). “I had the privilege of meeting this play of Jeanne Sakata’s in a very early stage of development, and was blessed to get to develop and direct it from then forward to its world premiere production and beyond. It has been an extraordinary gift,” said Kubzansky. “Hold These Truths” premiered at East West Players in 2007 under the title “Dawn’s Light: The Journey of Gordon Hirabayashi.” It has captivated audiences and sold out shows from coast to coast. Tuesday, May 30, to Friday, June 2, at 8 p.m.
Saturday, June 3, at 4 and 8 p.m.
Tuesday, June 6, to Friday, June 9, at 8 p.m.
Saturday, June 10, at 4 and 8 p.m.
Sunday, June 11, at 2 and 7 p.m.
Tuesday, June 13, to Friday, June 16, at 8 p.m.
Saturday, June 17, at 4 and 8 p.m.
Sunday, June 18, at 2 and 7 p.m.
Tuesday, June 20, to Friday, June 23, at 8 p.m.
Saturday, June 24, at 4 and 8 p.m.
Sunday, June 25, at 2 and 7 p.m. Opening Night is on June 4 but is by invitation only. The Pasadena Playhouse is located at 39 S. El Molino Ave. in Pasadena. Tickets range from $25 to $80. Tickets are available online at http://PasadenaPlayhouse.org, by phone at (626) 356-7529 or at the box office.